LEMON KITSCHARMS - Vintage & Retro Jewellery: Christmas sale now on! Welcome! If you like vintage or looking for something unique for your wardrobe, you have come to the right place. I specialise in vintage & retro jewellery, as well as quality handmade accessories created with a vintage flair. High quality jewellery at affordable prices. Almost all pieces are one piece only. There is also a section of vintage clothing and other collectibles. Please head to our new shopping interface at http://lemonkitscharms.com to start shopping! Hey folks, it's that time of the year again and Lemon Kitscharms are having 15% off storewide! 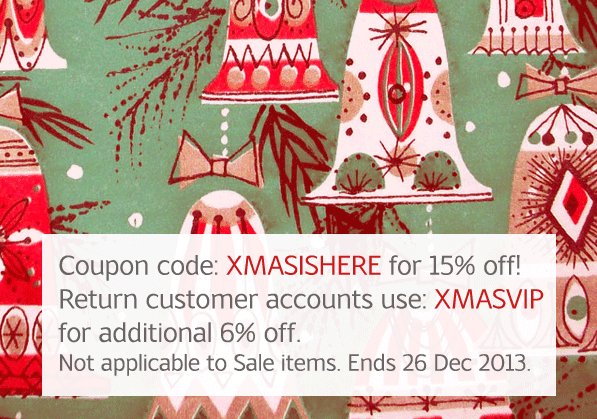 Set up an account and use the coupon code XMASISHERE to get the discount! If you have a return customer account, use coupon code XMASVIP to get an additional 6% off your usual ten percent discount. Excludes sale items, code expires 26 Dec 2013.